Magisso Bamboo Cutter Breathes New Life Into Boring Old Item | OhGizmo! Who thinks twice about a cutting board? It’s a cutting board, for crying out loud! But hey, this is just the kind of thing we like to see being put through the creative process, only to emerge bettered. 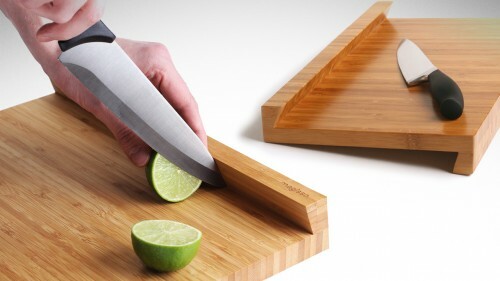 The Magisso cutting board features two innocuous looking ridges on opposing sides but whose presence have a pretty substantial impact on usability. One ridge hangs off the counter, preventing the board from sliding around while the other gives your knife a cradle to simplify chopping. The top ridge also helps you funnel your consumables where you want them once they’ve been cut up. It’s smart and simple and if we ever cooked anything other than KD, we’d be all over it. It’s $50. I fail to see how something that “cradles” my knife would help in any way. In fact, it looks terribly dangerous for anything except getting chopped stuffs off. Even then, its way too much in the freaking WAY of everything! The ‘cradle’ for the knife looks like it inhibits you from lifting the knife any higher than the angle shown in the photo while up against it. Just look at the photo. That’s as high as he can lift the knife – which is not high enohgh to cut another slice from the lime (or to halve the lime in the first place) – unless he moves the lime and the knife away from that inhibitive edge.